If you travel, the one sure-fire way to forget you are jostling around on a road, bouncing over railroad tracks, or strapped into a narrow airplane seat, is with some great tunes. Our very own John Mulhern III, beat me to the punch and reviewed the superb Oppo PM-3 Planar Magnetic Headphones and the Oppo HA-2 Amp/DAC. With recently released music from HD Tracks, I wondered how the combination performed on Planes, Trains, and Automobiles! Is this the perfect portable audio companion for you? We have reviewed travel friendly products in the past, such as the Audioengine D3 USB DAC, the Dragonfly USB DAC, along with Etymotic Earphones, Audio-Technica Headphones, Oppo PM-1 and PM-2 planar headphones, among others. Equipped with a laptop, a USB DAC, and storage, it’s possible to experience great sound on the road. But, there are times when you don’t want to be limited to a laptop, especially with their limited battery life. When John and I met with Oppo’s Jason Liao, we were excited by their new PM-3 Closed Back Planar Magnetic Headphones, and the HA-2, a stunning new, leather covered portable USB DAC and Headphone Amp with an internal battery to power it up. We think the PM-1 and PM-2 headphones are best-in-class, but they are open-air, and thus not only can you hear ambient noise around you, everyone around you can hear your audio. Seriously, do you want your seatmates to know you love Justin Bieber? Not to mention that those are premium products, so probably best not being bounced around on the road. The Oppo PM-3 comes in two colors, black, and a new white version. Just about everything I have is black, so my wife and son said "Get the white ones, you have so many black headphones already" so, I now have the white models, which are quite cool looking, and suddenly I’m ready to be a hipster fashionista ready to walk the rough and tumble streets of Park Slope, Brooklyn. Faced with lots of travel, including cars, trains, flights, subways, and hotel stays, I set up a test for myself. 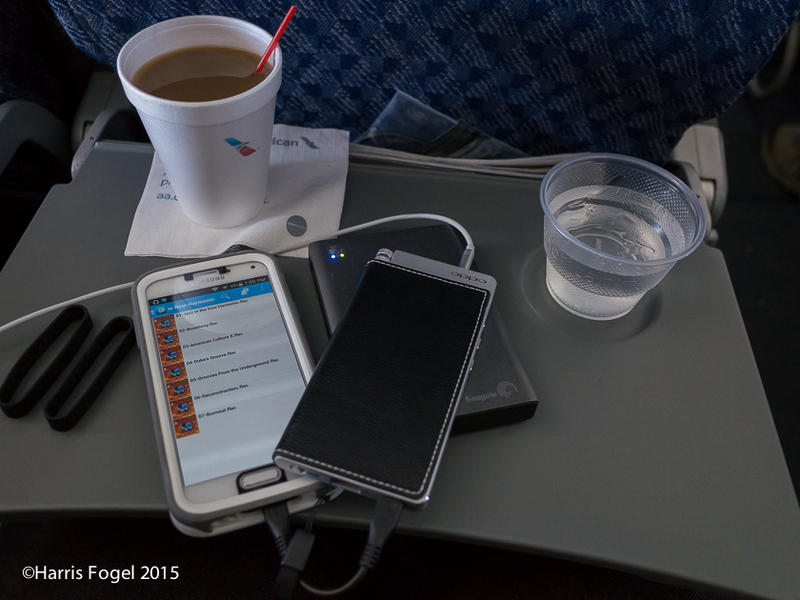 I loaded a slew of new releases from HD Tracks onto a Seagate Wireless Plus hard drive, made sure my Virgin Mobile Samsung S5 had the latest Seagate app, loaded the same app on our iPad, charged all the batteries, loaded the PM-3 and HA-2 into my carry-on-bags and away we went. I began by attending the Society for Photographic conference in New Orleans, and thought it would be an ideal way to test the new gear on the road, in planes, etc. My first thoughts were that the combination of the HA-2 and PM-3s were a dream combo. The PM-3 had almost no sound leakage, and I asked my fellow passengers to listen for leakage and they said they couldn't hear anything, even when I cranked the volume, and the ambient noise isolation was very good. As for comfort, they were ideal, not too heavy, not too warm, and extremely comfortable. Using the HA-2 took a different turn. I don't really have much music stored on my Samsung S5, or my older iPad Retina. So, I brought along a Seagate Wireless Plus drive with a built-in hotspot. Using the older 30-pin iPad cable to the HA-2 worked great, and I streamed high-res audio FLACs to the iPad, and then played them using Capriccio to the HA-2. I also tried with the HA-2 rubber (Oppo supplied) banded to my S5, using the small Oppo supplied mini to mini USB connector between the phone and HA-2, and played a few files that I had on phone (Rolling Stones - Official Bootlegs, Brussels, and Los Angeles concerts) and they sounded fine, limited by their MP3 source compression, but still a significant improvement over the S5 directly to the PM-3 headphones. I then used the browser on the phone to connect to the Seagate Wireless Plus and once again the files played just fine, which amazed me since they were high-res FLACs, but I was told by Seagate that the app or browser simply sends the data to whatever device is waiting for it, and since the HA-2 can decode just about anything you throw at it, it did just that. I had a bit of worry that I damaged the phone cable for the PM-3, as I couldn't get both channels playing properly, but it was a "Doh!" moment. I had inserted the wrong end of the cable into the PM-3s, so once I figured it out and plugged the proper side of the cable into the headphones all was fine! My bad! By the end of the flights, I found myself tossing the Seagate Wireless Plus drive into my backpack, and the phone/HA-2 rubber banded combo into my jacket pocket and all was well, high-quality music on the road, with lots of titles from HD Tracks to choose from. The recent compliation, The Best of the Grateful Dead, restored with the assistance of the Plagent Process, was an audio tour-de-force of the Dead. The spatial quality in this high-resolution release was a perfect match for the Oppo gear, and when I played the combo for a colleague during the Photo Lucida conference in Portland a month later, he just kept smiling, and playing track after track. Listening to tracks from American Beauty from the Greatest Hits compilation, even compared to the DVD-Audio release, the newly restored versions sparkled with life. This is also the only way to access the new Plagent Process restorations without purchasing the box set, as the solo releases of Workingman's Dead and American Beauty are older versions, not the Plagent Process versions. One much heralded set of releases on HD Tracks was the release of the Tom Petty catalog, all in high-res, carefully restored and released with little or no compression by Ryan Ulyate, and reveling in all the glory of Tom Petty, either solo or with the Heartbreakers. We grew up with that music, so first experienced it on Vinyl, then cassette, even 8-Track, and Audio CD, and the HD Tracks releases are the best yet. We auditioned Petty’s debut album Tom Petty & the Heartbreakers, Damn the Torpedoes, Into the Great Wide Open, Full Moon Fever, and Hard Promises. All are must-have’s for the Tom Petty fan. I was particularly interested in how Full Moon Fever and Hard Promises sounded, and in a word, they were splendid and worthwhile updates. The dynamics of the new versions are fuller, the lack of compression gives the music life, and the combination of the Oppo PM-2 and HA-2 provided a musical, open, and airy, soundstage. Bravo to Ulyate. Now, if they would just hurry up and release a re-mastered and non-compressed version of Wildflowers! I also began to listen to the recent batch of Lou Reed re-masters from HD Tracks. I’ll save the bulk of that report for another review, but Legendary Hearts and The Blue Mask both have a solid bass and percussion bottom end that is the test for any system, and the PM-3 and HA-2 delivered a solid, secure bass, with all the dynamics those albums were built around. When I recently flew to Portland, Oregon to attend the Photo Lucida conference, I brought along the system for review on the trip, and to keep me somewhat sane. I started the trip with David Chesky's "Jazz in the New Harmonic (pictured on my phone, with water and coffee nearby that prove I should know better. Don't worry, I moved the gear right after I took the photo! )", "Area 31", and the just released "The Best of the Grateful Dead" all from HD Tracks. As mentioned previously, the music was on a Seagate Wireless Plus Hard Drive, and using its WiFi capability was streamed to my Samsung S5, which was plugged into the new Oppo Digital HA-2 portable DAC/Headphone amp, and finally played through the new Oppo PM-3 closed back planar magnetic headphones. To say that the combination of outstanding music, gorgeous recordings, performances, and re-mastering made the trip far more enjoyable is an understatement. When I returned and was able to compare Paul Simon’s first three solo albums on HD Tracks, I compared the newly released high-bit versions to the 2004 Box Set re-mastered versions which we originally reviewed for Warner Brothers, and I found less compression, and a sense of immediacy that finally matched and even surpassed the original vinyl releases. From the Dixie Hummingbirds smooth flawless harmonies to the improved bass of Mother and Child Reunion, or one of my favorite tracks, Peace Like a River, gives a new lease on the audio quality that Roy Hallee endeavored to capture. The combination represents an astonishing leap in audio quality, and amazingly one that will fit in your pocket! When I played this combination for my colleagues at the conference, everyone was blown away. I just kept marveling at how far audio has come of late. With the decrease in LP quality beginning with the oil crisis, and then the first generation of CDs with those brittle migraine inducing tones, the rise and unfortunate fall of DVD-Audio, with SACD sort of hanging on, to the ability to download high-bit masters and restoration, that can all fit in your pocket, is an end result that should enthrall even the most hard bitten cynical audiophile. While there are suberb music players on the market, most are at a much higher price point then the combination of the HA-2, PM-3, and Seagate Wireless Plus. The key thing about DACs like the Oppo HA-2 is that they are certified for both Apple iOS and Android OS so it can skip over all the internal electronics, so you avoid the built-in DACs and amps. There are some issues that I'm still trying to solve, for example I'm using the Seagate app to find and use the drive, and surprisingly it also seems to play high-res FLAC files just fine, and the Oppo HA-2 works splendidly with it. However, the HA-2 doesn't have a sampling rate indicator, so I'm not entirely sure if the files are being down-sampled, or maintaining the source bit depth and sampling rate. I’ve been in touch with Seagate to understand what is happening, but my basic understanding is that it's just passing on the data, with no real changes. The Onkyo app is another high-res music player, and there are others like Capriccio. No matter, the final result was that I was able to listen to a ton of tracks, great audio, and with the Oppo PM-3s, I was a very happy traveller. But, if Oppo ever updates the HA-2, I’m hoping they will include a sampling rate and bit depth indicator. Hint, hint! As for hiss, I simply had nothing I could detect in normal use. In a dead quiet hotel room, using the PM-3's, I had the phones on my head, the HA-2 cranked up, and there was silence. Without noticing it the battery had run out on the Seagate unit, so there wasn't any music. I figured I needed to select some new tracks, and checked to see if the green LED was still lit on the HA-2, which it was. It was so quiet with the phones on and no source audio, and I then actively tried to identify a noise floor to no effect. I also tried the HA-2 with IEM's, and I have quite a few to choose from, with my favorites from Etymotic, with similar results. But for headphone use the Oppo HA-2 seems dead quiet. I did try them with Oppo PM-1 and PM-2, and several Audio-Technica headphones, and same results, no readily discernable hiss or noise. The HA-2 does run a bit warm, but this is expected for an amplifier of this design. Everyone who saw the combo asked to listen to them, and once they did, they wrote down the Oppo website in their phones, and I later learned that several of them purchased not only the headphones and amp, but the Seagate Wireless Plus HD. The use of the Seagate drive is important. High-Resolution files can easily reach 1GB or larger per title, and that quantity would overwhelm a phone, or iPad’s storage. You could purchase a large, and expensive SD or MicroSD card, which would solve the issue for a limited set of titles, although not with an iPad and its limited storage options. So, using a hard drive that can hold as much as 2 TBs of data, along with a built-in Wi-Fi hotspot, suddenly opens up a world of music to you, along with video and other documents. We found that once we set everything up, that using the Seagate Wireless Plus to provide those high-resolution titles from HD Tracks to either the Samsung S5, or an iPad, and then picked up by the Oppo HA-2, and finally played through the Oppo PM-3 Closed Back Planar Magnetic headphones can take the edge off almost any travel induced stress! The combination of the Oppo PM-3 Closed Back Planar Magnetic headphones, the Oppo HA-2 DAC/Headphone Amp, the Seagate Wireless Plus series of Wi-Fi enabled hard drives, loaded with titles from HD Tracks, is an audiophile travellers dream and comes highly recommended!